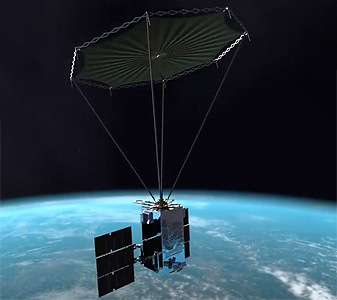 R3D2 (Radio Frequency Risk Reduction Deployment Demonstration) is a DARPA mission to space-qualify a new type of membrane reflectarray antenna. The antenna, made of a tissue-thin Kapton membrane, packs tightly for stowage during launch and then will deploy to its full size of 2.25 meters in diameter once it reaches low Earth orbit. Northrop Grumman is the prime contractor and integrated the 150 kg satellite; MMA Design designed and built the antenna. Trident Systems designed and built R3D2's software-defined radio, while Blue Canyon Technologies provided the FleXbus spacecraft bus, which is based on their Microsat/ESPAsat. The launch took place on a Rocket Lab USA Electron KS rocket from the company's launch complex on the Mahia Peninsula of New Zealand on 28 March 2019.